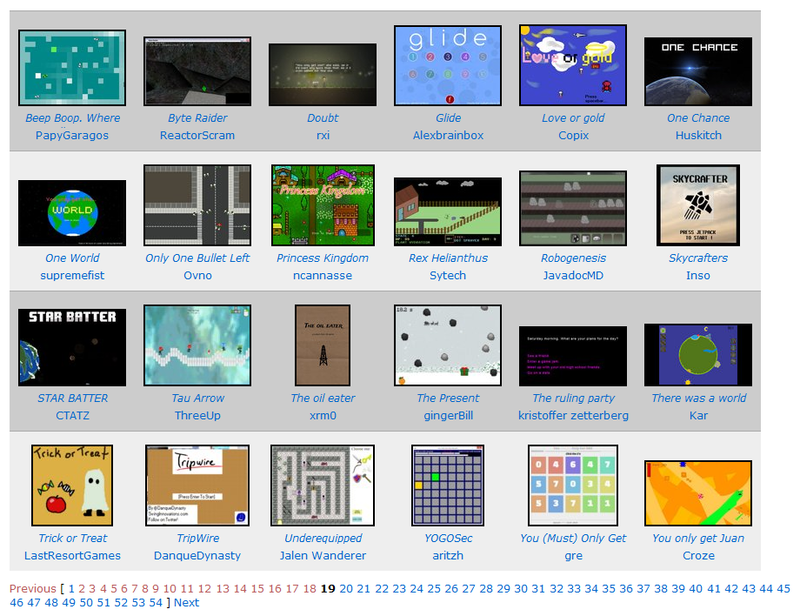 Here we see about 1.9% of the 48 Hour Competition entries for Ludum Dare 28. Mine's third from the left on the bottom row. Yep, I finished a game for Ludum Dare 28. And seriously, I'm actually surprised that I succeeded. 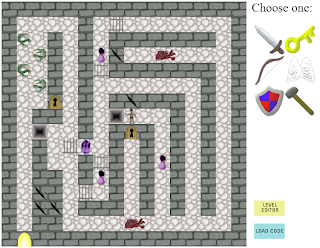 I'd never created a full HTML5 game before, and I thought it was probably kind of a fool's errand to try to do one in less than 24 hours. But I made it. Oh, it's a flawed game, certainly. There's plenty I'd have liked to do differently, if I had more time. 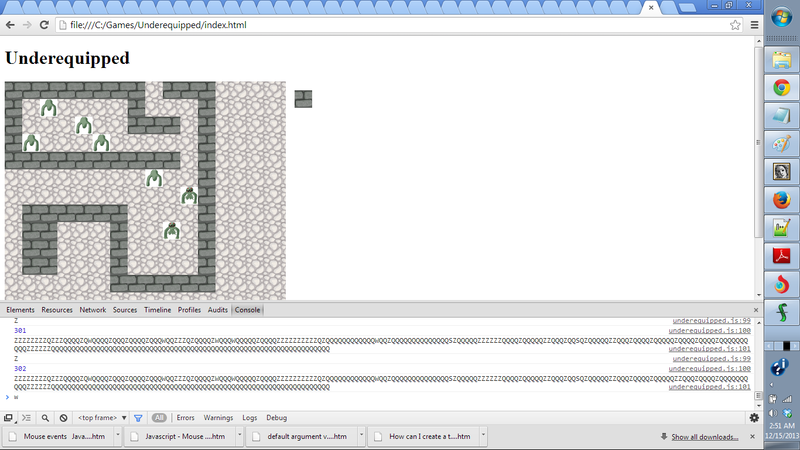 But it's a complete game, with five levels (though I'd have liked to have more, of course), and a working level editor. If anyone wants to try it out, here's the game. And you can see the source files here, should you care to look. I guess maybe I should talk about the level editor a little more, since that's, you know, kind of supposed to be the subject of this blog and all. 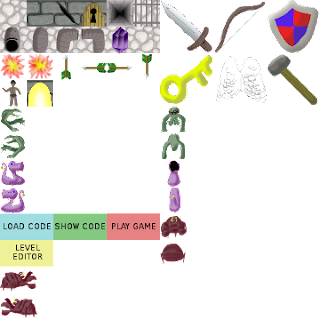 The level editor was actually the first part of the game I made, for the simple reason that I used it to make the levels, and before I could make the bit of actually playing the game, I needed to have levels to play. In a recent post, I mentioned that the standard for tile-based editors was to have the user choose a tile from a menu, and then paint with those tiles. I went on to opine that it made since that this method was so widespread, since was probably the most user-friendly way of creating tile-based maps. That being the case, one might expect that I would use that method in making a level editor for a tile-based game of my own. I do not expect to win any awards. (I'm not sure what awards there are anyway.) Even if there weren't more than 1200 entries (wow! 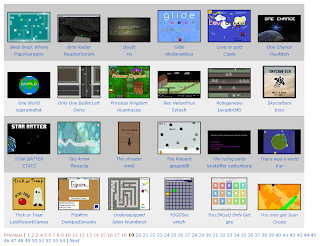 ), I'd be under no delusion that my first attempt at an HTML5 game would have any chance of placing. I wasn't in this for the competition. I'm just happy to have finished a game. And hey, if I managed to finish a game on my first time attempting Ludum Dare, and after having gotten such a late start and having so many other commitments to deal with... yeah, I'm definitely doing this again next time. Unless it happens to fall on a weekend even busier than this one, I guess. Better graphics. Obviously. In particular, I'd have liked the player and the monsters to be animated. I'd originally intended for them to be, but I realized there'd be no time to do multiple frames of animation if I still wanted to have time left for the coding. Had I more time, I'd also intended for the player sprite to have different graphics for the direction he's facing. And maybe also for the item he chose. More levels. This is another big one. Five levels is something, but it isn't much. I'd intended for a theme for the levels to be that there's a fairly obvious and straightforward way through with one item, but if you wanted to pick up the gem you'd have to use a different tool and take a less obvious and more tortuous route. Better collision detection. Yeah. Sometimes the player kind of slides his shoulder through a wall. I was trying to improve this right up until the deadline, with limited success. I think I know now what I'd have to do to fix it, but of course now I don't have time. More error catching in general. The program's pretty sloppy right now in general as far as letting the user do things it probably shouldn't. 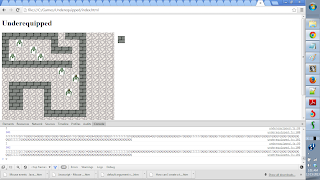 For instance, it's possible to put in multiple starting points in a map. This doesn't crash the program, or anything—basically, because of how the program reads the map, I'm pretty sure it should just use the lowest starting point, or in the case of a tie the rightmost of those tied for lowest—but it still should probably have been disallowed. As briefly referenced in the instructions, I'd wanted to have pressure plates that would create or cancel walls of energy or something elsewhere in the maps. I realized pretty early on that I wasn't likely to have time to implement that, though, which is a bit of a pity since it could have led to some nice puzzles. Sound. A scream when the player falls in a pit, a crackle of a fireball... would have added something. A more attractive intro and instructions. The all-text intro that's there now was of course quick and easy to create, but some graphics and a better layout would have greatly improved it. A better win routine, too. Slapping "You win!" over the screen in big letters is arguably somewhat anticlimactic. Cookies to keep track of what level the player reached if he quits the game and comes back to it later. Possibly implementing some simple data compression on the maps, so they're not all stored as strings exactly 256 characters long with lots of repetition. A catchier name. Seriously. "Underequipped"? What was I thinking? The screenshot of my game I submitted to the Ludum Dare site. Next post will be about Eamon, I promise. And for now... I'm going to get some sleep.